My review of The Crown Conspiracy. I’m quickly learning that if The Riyria Revelations series were a drug, I’d be an addict craving my next hit at this point in time. I enjoyed The Crown Conspiracy. 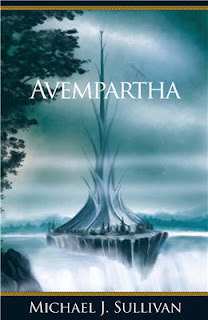 It was a book that certainly hit a home run, but Avempartha hit the ball out of the park and left me breathless afterward. Avempartha is an adventure book complete with mystical sword, but there’s more to it than that. Sullivan really took his time to create a subtle depth to his world with this second installment in the series. This book is a semi-stand alone taking place in the same world as the first book and with many of the same characters yet hinting at a much bigger overall picture. The beauty of this book, in my opinion, was the subtlety and details offered. While there was an obvious quest going on, the real interesting and important parts of the book seem to be in the details and it’s these details that astounded me. Avempartha is full of complex opposites which can be important for the depth of the world. An example of what I mean is the tower of Avempartha itself. The tower is mysterious; a real feat of engineering and strangely elegant while the people in the nearest town live in crappy huts with their farm animals – the perfect symbolic juxtaposition of the elves and humans. More was said about the mysterious elves by their tower Avempartha than any detailed description or historical infodump could have provided the reader. Sullivan also takes time to add detail to his characters; many of which are repeats from The Crown Conspiracy. It quickly becomes apparent that everyone has a history, motivation or story that will become important to the series as a whole. Though Sullivan craftily throws some bones at the reader, he keeps enough about these characters mysterious enough to make the reader not only curious about the plot but the characters as well. It is the depth of Avempartha that makes it shine. Sullivan subtly details his world weaving together complex histories, political motivations and even some religious details. The impressive thing is that he does this all in a book that weighs in at slightly over 300 pages. He doesn’t hit the reader on the head with any of these details. Instead he seamlessly weaves in more information regarding his world and cultures as the story progresses. This means that the reader gains a lot more information about the world and characters without, perhaps, realizing they are doing so. That’s an impressive feat. Sullivan could probably teach other authors a thing or two about how to avoid massive, tedious infodumps. While there are enough typical fantasy elements here, (the sword, the epic quest to slay the dragon-like thing and etc) the book is littered with new elements. I’m not sure if Sullivan meant it this way, but this book on one level, was about new battling old. Old fantasy elements will always have their place, but Sullivan is obviously trying to do something new with this series. The push and pull of new vs. old and the end result really reflect what he’s trying to do with The Riyria Revelations. Perhaps I read into things too deeply, but that was one point of the book that interested me as a reader as it seemed to be a subtle statement of sorts about the overall goals of the author regarding his books. As with The Crown Conspiracy, Sullivan’s writing is simple and to the point with no names as long as my arm or obscure spells to wade through. However, the names for people and places he does use are different enough to really add a nice, foreign flavor to his world. The book, on the whole, is easy to understand and absorb due to his decision to keep names simple and flowing. His writing is uncomplicated, but there is so much depth and layers of the world and characters that the simple, fluid writing is almost deceptive. This also means that more readers will probably enjoy his books. A reader can enjoy it for the surface level action-adventure plot and its compelling characters, or a reader can enjoying for the plot, as well as the subtle details and surprising depth. All in all, I loved this book for it’s writing, depth and detail as well as the characters which seemed to spring to life from the pages. Avempartha is a book many readers will enjoy for the action-adventure aspects, as well as for the world building and details. The ending is satisfying and, perhaps, for the first time it becomes apparent that there are quite a few unanswered questions and plotlines that will connect the books in the series. The Crown Conspiracy was a prologue. Avempartha is where the series takes off. Sullivan has proven his point. You don’t need an 800 page book to tell an amazing epic fantasy tale. I'm planning on starting on the next book fairly soon. This series is incredible!